2 Why Should You Get a Comfort Height Toilet? 3 What Should You Consider in a Comfort Height Toilet? 4 How to Measure the Toilet Seat? Did you know that in lines with the World Toilet Organization (WTO), the average person utilizes a toilet approximately 2,500 times a year, and up to eight times a day? This is a lot. Hence, your choice of toilet matters more than you think, even though, at first glance, you might be tempted to believe that toilets aren’t so different from one another. That couldn’t be farther from the truth – as the comfort height toilets distinguish themselves in many ways. For one thing, they are supposed to be infinitely more comfortable than standard toilets. Essentially, these are created for taller individuals, as you might expect. 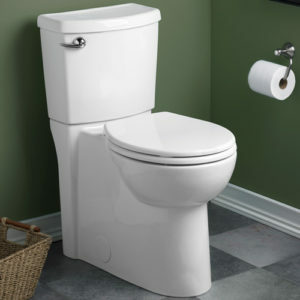 It’s as simple as that: the taller the toilet, the easier it is to sit down and stand up, as well as rest your feet on the floor. However, choosing a product out of the numerous items you can find on the market isn’t easy. This is why we believe that our tall toilet reviews could help you make the right purchase. Dimensions : 28 x 19.5 x 28.5"
Dimensions : 31 x 20.8 x 29"
Dimensions : 28.8 x 17.6 x 30.8"
Dimensions : 28.5 x 14.5 x 27.5"
Dimensions : 19 x 9.4 x 15.2"
Dimensions : 28.2 x 15.8 x 30.8"
This toilet features a timeless, classic design, being perfectly fitted for almost any bathroom. Thanks to the use of SanaGloss technology, the inside of the bowl is specifically shiny. 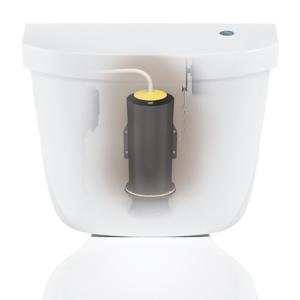 Concurrently, the ion barrier thoroughly cleanses the toilet with every flush. Another distinguishing characteristic is the fact that the flush is really fast. That is to say, the 3-inch flush valve is much larger than standard 2-inch flush valves – by 125 percent. On a different note, this doesn’t make the toilet be unusually loud, which can be an inconvenience – quite the contrary, it operates quietly, while providing a commercial-grade like performance. So, if you’ve ever encountered problems with toilets that don’t manage to evacuate on the first flush, the TOTO Drake won’t disappoint you. This is backed up in numerous Toto toilet reviews. Nonetheless, as a potential disadvantage, this toilet tends to be a tad noisy when the tank is refilled with water. 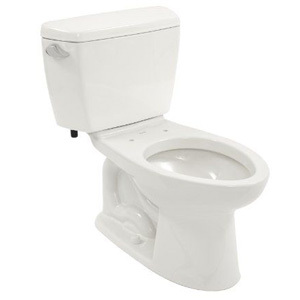 This is another top-rated toilet featuring an elongated bowl that provides additional room and comfort. 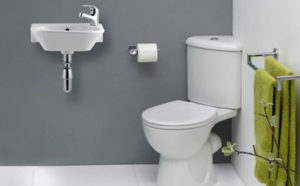 It is actually introduced as a comfort height unit – being 2 inches taller than standard toilets. You will definitely appreciate the additional leg room facilitated by the elongated bowl. An advantage worth noting would be that this toilet is really efficient. The water reaches the valve from 360 degrees, thus creating a consistent water flow to the bowl, from every side. It goes without saying that this maximizes the efficacy of each flush. Additionally, the light-touch flush is a great feature, as it entails a lower actuation force, in comparison to a flapper. Plus, thanks to the 3:2 ratio between the outlet harnesses and valve intake, the natural force of gravity enhances the performance of the flush. The fact that it operates quietly comes as an advantage, as well. 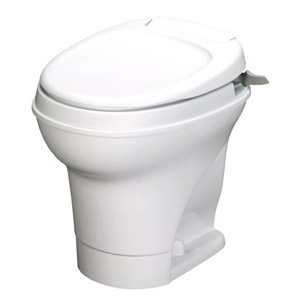 This product has reached our selection of quality toilets due to its efficacy and excellent assemble of features. 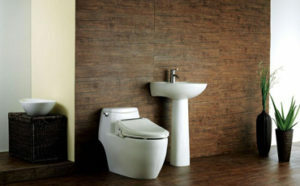 The elongated bowl doesn’t take up too much space, making this toilet a good fit even for smaller bathrooms. 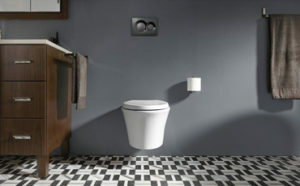 In the meantime, the design does play a role in increasing the comfort level of the toilet. Also, thanks to the chair-height seating, this toilet is perfectly suitable for most adults, diminishing the incidence of joint pains. The design is modern and contemporary. Thus, this makes it widely suitable for most bathrooms. Moving on, the AquaPiston technology is a major plus, delivering a powerful flush engine. This is why the toilet is thoroughly cleaned with one flush only. At the same time, it utilizes less water than standard toilets – namely 1.6 gallons of water per flush. 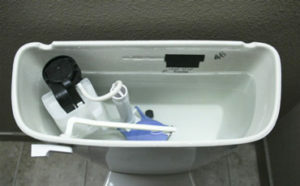 However, some users have complained that the tank-to-bowl mounting system isn’t as good as in the case of other Kohler toilets. 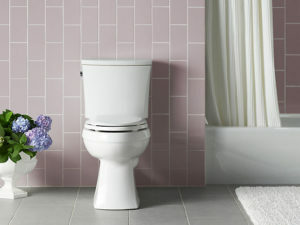 If you like modern, sleek designs, we believe that this one-piece toilet by WoodBridge will be down your alley. Simultaneously, the quality construction comes as a guarantee, indicating elegant craftsmanship. Moreover, thanks to the easy-to-clean design, maintaining the toilet in excellent condition shouldn’t be too difficult or time-consuming. In other words, there aren’t any grooves or corners to complicate your job. Plus, thanks to the siphon flushing, the flush is powerful, yet quiet. That is to say, you won’t have to worry about leaks or clogs. Another nice feature is that the toilet comes accompanied by a soft closing seat. 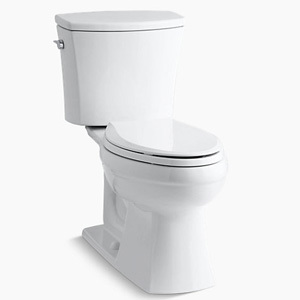 Plus, due to the dual-flush system, this toilet uses roughly 1.28 gallons per flush. That is to say, if you really want to diminish your water consumption, getting this toilet might help you reach this purpose. As a drawback, though, installing this in a small space can be quite problematic. 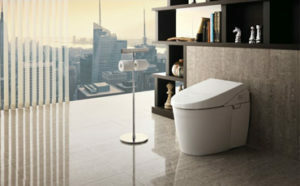 Now we’d like to introduce you to a top one-piece toilet, featuring a high profile, thus offering maximum comfort. This was designed to facilitate full-bowl coverage. Essentially, this toilet comes in a low profile design, as well – allowing users to pick the item that addresses their needs best. Leaving that aside, the Aqua-Magic is made of plastic, which isn’t that common for toilets. However, a plastic construction makes the toilet lightweight and easy to use. What is more, the textured lid is made to shade water while withstanding scuffs. Plus, the pedal flush acts as a dual flush system. That is to say, if you press the handle halfway, this will add more water to the bowl. On the other side, if you press it all the way, this will open the valve and flush the toilet. Also, in order to make the toilet water efficient, there is also a water-saver hand sprayer. You must also keep in mind that this toilet has a pretty noisy operation. This is another toilet meant to facilitate a chair level seating. The front design is round, featuring a white finish. At the same time, you get the seat included. However, some former customers weren’t fully pleased with the quality and comfort level provided by the seat. That is to say, larger persons might find the seat uncomfortable. Moving on, the three-inch flush valve manages to clean the bowl effectively, every single time. In other words, clogging this toilet is next to impossible. 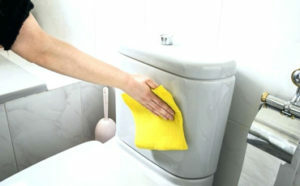 On a different note, the smooth, EverClean surface restricts the levels of bacteria, preventing germs from building up. This is an excellent toilet that would work great for people with disabilities. And this is a good option of comfort toilet if you’re on the lookout for compact toilets for small bathrooms. Also, if you aim at reducing your water intake, you should be pleased to learn that this toilet utilizes 1.28 gallons of water per flush. This is the most water-efficient rating at the moment. 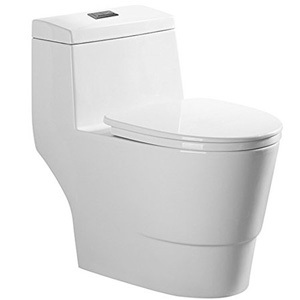 Our last recommendation for best comfort height toilets is another product manufactured by Kohler, whose height is of 18 inches. Aside from the fact that it is really comfy, this toilet is also efficient. That is to say, you can say goodbye to clogging accidents. It even works wonders in poor drainage areas. At the same time, previous users noted that the installation process isn’t too difficult, which comes as another pro. What is more, the pressure tank is filled right away, and the flush works as expected. Still, the thing is that the flush is quite loud, which might be a tad disturbing to some people. We also like that it is available in four different colors, meaning that you can pick the one that suits your bathroom best, style wise. Plus, it will help you cut down your water consumption since it utilizes 1.4 gallons of water per flush. Why Should You Get a Comfort Height Toilet? First and foremost, a comfort toilet is highly recommended for tall people, as well as handicapped and elderly users. 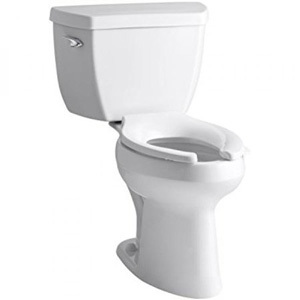 In order for a toilet to be presented as a comfort toilet, its height should range from 16 to 19 inches. The standard height for most toilets is of 15 inches. Additionally, some tall toilets are also ADA compliant – being created in order to address the individual specifications of the ADA guidelines. Specifically, these toilets are widely suitable for users coping with joints pains or disabilities. Tall people might find toilets with standard height rather uncomfortable – that is primarily due to the low profile. Standing-up and seating-down are made easy while reducing the incidence of back and joint aches. Moving on, it goes without saying that elderly citizens have distinctive needs. And this applies when it comes to shopping for toilets, as well. 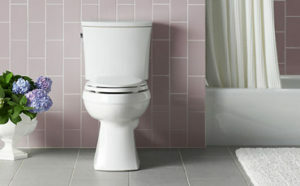 Tall toilets are often recommended for the elderly because they usually have a high-performance flushing system. Essentially, the comfortable height makes it easy to pass on and off the seat, even for those dealing with arthritis or any other conditions. As a rule of thumb, the recommended toilet height for disabled users ranges between 17 and 19-inches. This measurement is similar to a standard chair. That being said, if a member of the house utilizes a wheelchair, making the transfer from the wheelchair to the toilet is made easy, since the height is almost identical. What Should You Consider in a Comfort Height Toilet? A good purchase is one that is well-researched. That is to say, you shouldn’t make a hasty decision when you’re shopping for toilets. Hence, do factor in the following guidelines to ensure that you’ve made the right long-term investment. 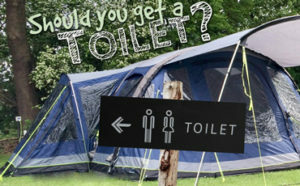 This is, perhaps, one of the most important considerations when you’re shopping for a new toilet. Assessing the area you have for your toilet will make your search easier. 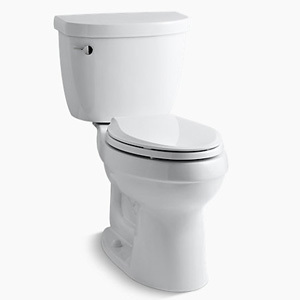 Considering that you live in an apartment, or your bathroom is really small, a compact toilet would work best. 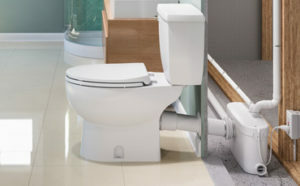 Always determine the clearance space – which is the space around the toilet. You should note that different States feature specific regulations concerning the specifications of clearance distance. This is why we advise you to check the local building code for bathroom layout and design. 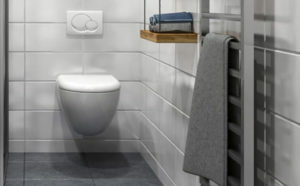 Comfort height toilets are separated into two primary categories when it comes to bowl type – namely round and elongated. While it’s true that some units are equipped with square bowls, these aren’t as commonly met. Elongated bowls are made to facilitate a higher level of comfort. Meanwhile, round bowls are suitable for users that want to save space. The toilet’s flushing system is an equally important consideration. That’s because some systems are more effective than others. 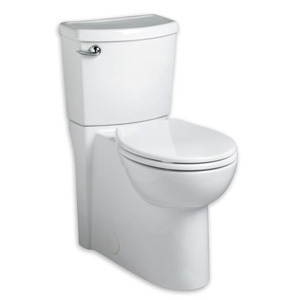 For one thing, there is the dual-flush system, which allows you to choose between a powerful and an average flush. The latter one is designed for eliminating liquid waste whereas the more powerful one is meant to get rid of solid waste. Moving on, there is also the AquaPiston technology. This specific flushing system aims at maximizing the water pressure; thus, ensuring that the water reaches the entire perimeter of the rim. 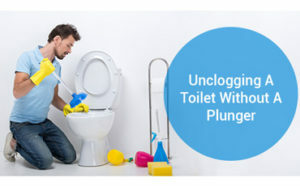 That is to say, the waste is cleared with one single flush, without the risk of clogging. Typically, the best comfort height toilets aim at protecting the environment, in the sense that they consume the minimum amount of water. Did you know that a family utilizes up to 400 gallons of water per day? Not to mention that a leaky toilet might waste approximately 200 gallons a day. This is why it’s critical to invest in a high-quality, well-made toilet that addresses these stressing concerns, as well. Even though more modern toilets might account for pricier investments, in the long run, they will help you cut down on water consumption. And, most importantly, such a purchase aims at protecting the environment, as well. 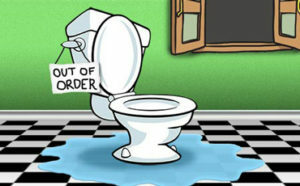 This is why it’s highly recommended to assess the water per flush rating of a toilet, especially nowadays. 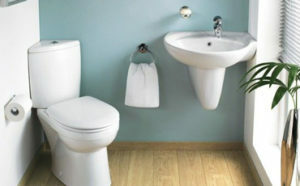 Essentially, both standard and comfort height toilets are available in different styles and colors. The most popular options are white or beige. Nonetheless, when it comes to design, color is not the only consideration. You can also choose between one-piece and two-piece designs. 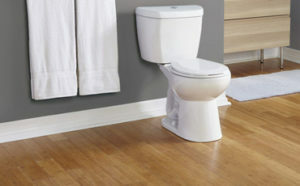 In general, two-piece toilets tend to be more affordable than one-piece toilets, while having a more traditional appeal. On the other side, two-piece toilets are associated with a sleek look. How to Measure the Toilet Seat? While it is definitely true that getting the best toilet should be your priority, you shouldn’t overlook the importance of the seat, either. If the toilet seat isn’t comfortable, then having a high-quality toilet won’t suffice, as your comfort will definitely be impaired. Even though some of the models we included in today’s guide come with a toilet seat, others don’t. That being said, when browsing for the right model, you should get the right measurements, of course. Here are the steps you should follow. The first thing you should do is get the measurements from the post hole to post hole, at the back of the seating area. Typically, the standard measurement is 5 ½ inches between the two holes. Moving on, get a measuring tape, and locate it on the center front of the toilet bowl. Make sure it reaches the center of the hinges, right between the post holes. If the measurement you get is roughly 16 ½ inches, you should get the round seat. However, if the length is 18 ½ inches, you should get an elongated seat. Next, you should assess the width of the toilet seat. Hence, you should measure the longest distance between the two ends. In order to get the final measurement, you should establish the length of the seat – namely the distance from the front of the toilet seat to the back of the seat. Once again, you should take the longest measurement. To conclude, comfort height toilets are perfectly suitable for tall people, as well as elderly and disabled individuals. The best part about these toilets is that they do an excellent job of diminishing any signs of discomfort or joint pains. To ensure that you’ve made the right investment, always measure the area in which you plan to install the new toilet. Additionally, if the seat isn’t included with the purchase, you should direct the same amount of attention into getting a toilet seat with the correct measurements. The products we included in our guide combine high-quality with practicality. That is to say, regardless of the unit you are likely to pick, the odds are that you’ll be happy with your purchase. We are hopeful that you’ve found our tall toilets reviews helpful in the quest for finding the perfect toilet! Thanks for stopping by!